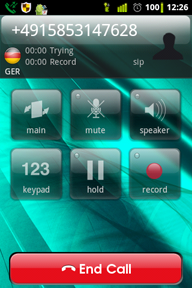 To place long-distance or international calls from your mobile phone or tablet computer, you can use an Internet phone – an application for mobile devices. We recommend Acrobits SoftPhone for mobile phones and tablets on the iOS (iPhone, iPad) or Android platform. You can download Acrobits SoftPhone from Apple App Store or Android Market directly on your mobile phone. We also recommend 3CX, a free softphone for iPhone and Android. Many handsets, in particular Nokia smartphones, come with preinstalled Internet call applications. Nokia users should review our instructions to start saving on Internet calls. 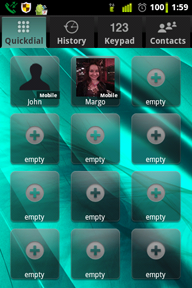 Acrobits Softphone is one of the best softphones for modern mobile platforms. 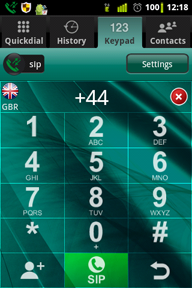 It lets you save on calls placed from your smartphone on the Android, iOS or Symbian platforms. Acrobits Softphone requires a constant Internet connection (3G or Wi-Fi). 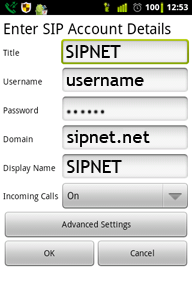 You need a SIPNET* account to start placing and receiving calls. You can register it on the SIPNET website. 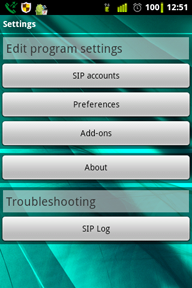 How to configure Acrobits Softphone to work in the SIPNET network? VoIP technologies enable a significant reduction in the per-minute call cost. 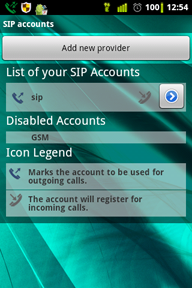 All calls are placed over the Internet at low SIPNET rates (link to rates). IMPORTANT: We recommend placing calls over a free Wi-Fi or 3G connection with the Unlimited Internet service enabled**. * Other service providers are also supported. ** Learn how to connect the Unlimited Internet service from your mobile operator.